Oh no! Not another "legend!" It seems so easy to drop that handle on someone, some movie star, singer, or whatever. They are legendary, they are great, they are one of a kind, etc. But, this night, I rubbed elbows with a true legend of jazz--again. 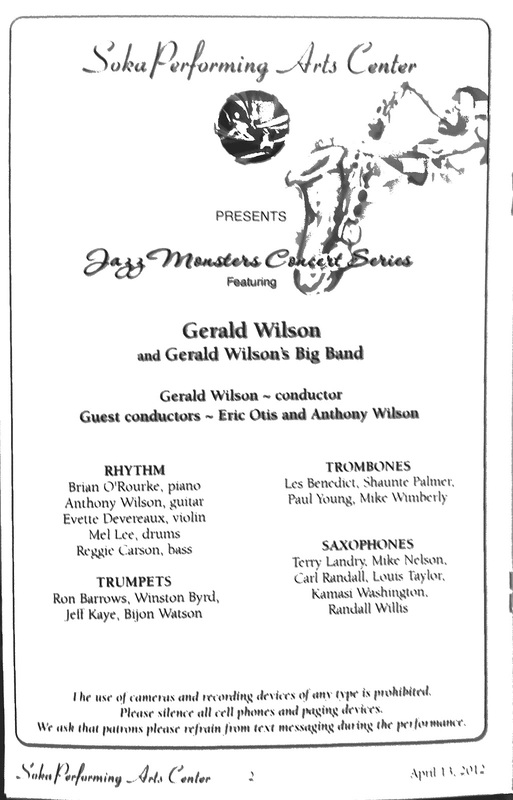 The legendary, great, one-of-a-kind jazz artist Gerald Wilson rides again. I've played lead trombone with Gerald's big band for sixteen years now, and it's as fresh and exciting as it was the very first time. Gerald was born in 1918 in Shelby, Mississippi, found his way to Detroit, studied music at Cass U., was one of the first black (may I use that term for a "person of color?") men in the U.S. Navy in a non-menial job (he, along with the late trumpet legend--see, there's that word again--Snooky Young, were in the Navy band at Great Lakes Naval Center). He later played with the legendary (oops, it's becoming a habit; but there are legends in jazz, some of whom are not mentioned as frequently as they should) Jimmy Lunceford band, then with Count Basie. He wrote for both bandleaders, and also for the legendary Duke Ellington. He was the first bandleader to record in Capitol Records, on an album accompanying the legendary singer Nancy Wilson in 1963. 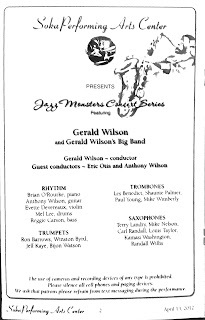 Gerald started his own big band in Los Angeles in 1947, I believe, and still leads it today at age 93. He is as spry as a youngster when he's in front of the band, and still knows exactly what he wants to hear and how to get it out of the band. I listened to recordings of the band while a college student in the 1960s, and when I was in the Air Force, a hot dog stand behind the PACAF band room at Hickam AFB, Hawaii, had a juke box with Gerald's recordings on it. I would listen and wonder how someone might possibly ever get to play with such a wonderful band. My own career advanced, and I was recruited by the legendary Buddy Collette to perform with his band. In 1996, the Library of Congress brought three West Coast bands from L.A. to Washington, D.C. to perform in the then newly renovated Lincoln Theater. Buddy's band played the first night, Gerald's the second, and the legendary Benny Carter the third night. Gerald attended the performance of Buddy's band, heard me play, and asked his contractor to begin calling me for his own band. In those intervening sixteen years I have missed only one performance with the band, when I was on tour in Japan and couldn't get back to the States for a concert. Tonight we performed to a very receptive crowd at SOKA University in Aliso Viejo, California. Gerald was his usual precocious self, keeping the audience laughing at his stories and enthralled at his music. And afterward, Gerald, as always, thanked me for being there and told me what a great musician he thinks I am. I couldn't be more proud. One of my fondest memories as a player is of playing at the Detroit Jazz Festival, where we participated in a Battle of the Bands with the legendary Count Basie Orchestra. After the performance, as I was looking for a safe way off of the high riser the trombone section was perched on, I looked down and saw then 90-year-old Gerald Wilson, extending his arm and saying, "Let me give you a hand, Les; we can't afford to lose you." Of such stuff legends are made.